Under the circumstances any recording that opens up two major works of Sibelius would be welcomed. But this can be firmly recommended on all accounts. Soile Isokoski and Jaakko Kortekangas are excellent soioists and the performances generally are admirable. Segerstam gives a very convincing account of Finlandia and the other two pieces. 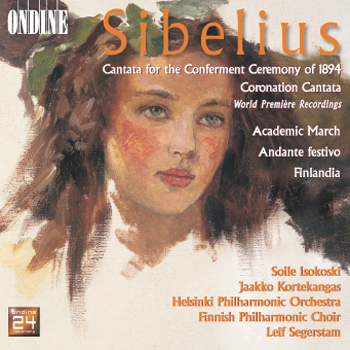 This recording contains five works Jean Sibelius wrote on commission for festive events, including his famous Finlanda, Andante festivo and Academic March, as well as world première recordings of two academic cantatas, performed by the Finnish Philharmonic Choir and the Helsinki Philharmonic Orchestra under the direction of Leif Segerstam. As acting music teacher of the Helsinki University, Sibelius was commissioned to write and conduct the Cantata for the Conferment Ceremony 1894, to a festive poem by Kasimir Leino. Its second movement contains soloist roles performed by soprano Soile Isokoski and baritone Jaakko Kortekangas. Sibelius's second cantata, to a text by Paavo Cajander, had not been heard since its first performance at the Finnish celebration in honour of the coronation of Nicholas II (as Tsar of Russia and Grand Duke of Finland) in 1896.